We just changed the group format of our Track Day at Thunderhill Raceway on 5/6/2017. We will run in three level groups now instead of four, and give our riders 5 minutes per session more, so 7×20 minutes instead of 7×15 minutes. As usual, we won’t have a group A, though we welcome every A-level rider who knows about their responsibility and to be a role-model. Group B+ will be good for slightly more advanced street (also track riders of course) riders – on sport or race bikes. Passing rules 4ft. 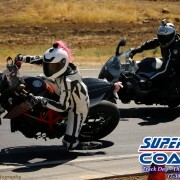 Group B is good for experienced riders street riders- or sport bikes and sport touring bikes. Passing rules 5ft. Group C is good for novice and intermediate street riders- or sport touring and touring bikes. Passing rules 6ft.